Chosen by Condé Nast Traveler as the “Best Island in the United States,” you should definitely have Hilton Head, South Carolina on your radar. Keep reading to see our list of the best Hilton Head Airbnb rentals. You’ll find gorgeous Hilton Head Island in South Carolina’s southeastern Lowcountry region, running right along the Atlantic seaboard. There are all sorts of things to see and do on Hilton Head Island, from shopping and golf to some of the United States’s top-rated beaches. With so much on offer, it’s easy to see why Hilton Head is one of the best destinations for a South Carolina family vacation. If you’re wondering, “where are the best places to stay on Hilton Head,” we can help! The best places to stay on Hilton Head Island are North Forest Beach, South Forest Beach, and Sea Pines. We’ve rounded up the best Hilton Head Airbnb rentals in these top areas for you and shared them below. 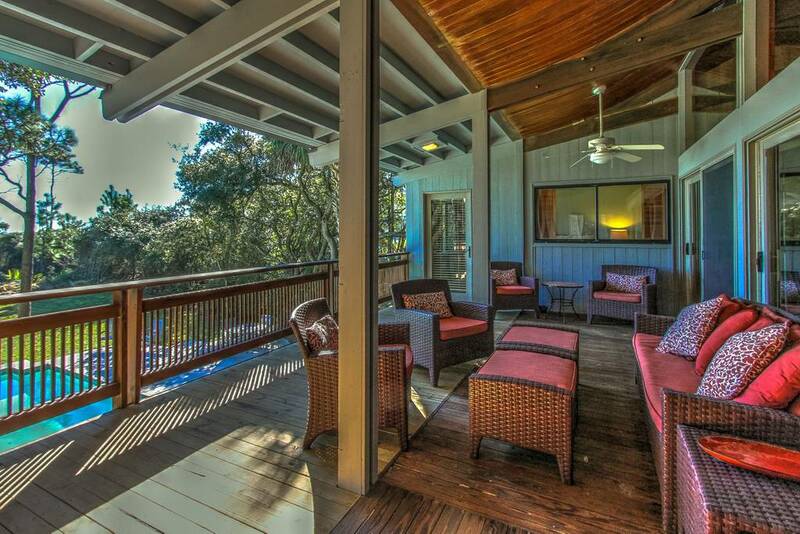 We’re starting strong with this spectacular, oceanfront Sea Pines Hilton Head Airbnb! This enormous estate has unobstructed views of the Atlantic Ocean and private beach access down a short, sandy trail. 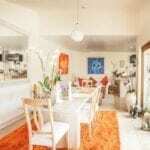 There’s room for up to 12 guests at this idyllic property with six bedrooms and 6.5 bathrooms. 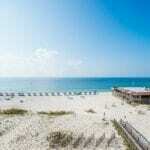 It’s particularly well-suited for multi-general families or a group of couples vacationing together. This spectacular home is laid out in an open, airy floor plan with large master-style bedrooms, breathtaking views, and many modern upgrades. 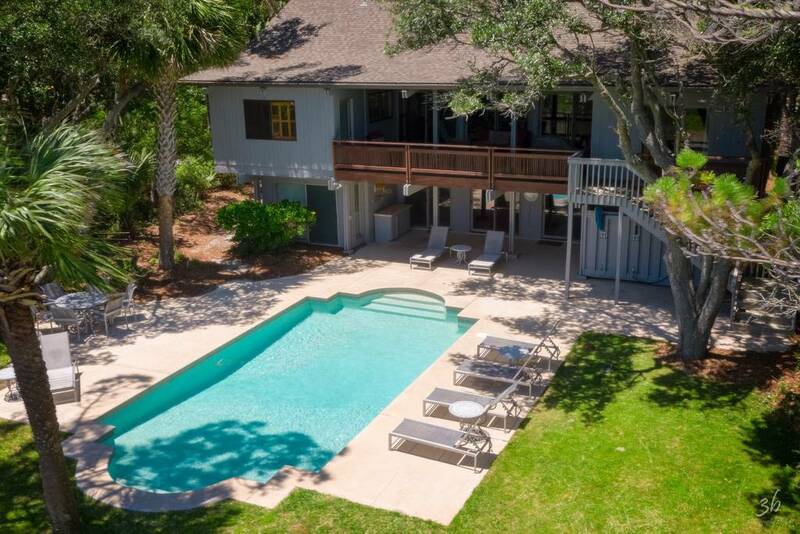 Available from around $880 a night, this luxury Hilton Head vacation rental is also located in one of the most desirable areas of the island. Sea Pines Plantation is one of the original private communities on HHI and perfect for a group seeking more peace and privacy away from the tourists. 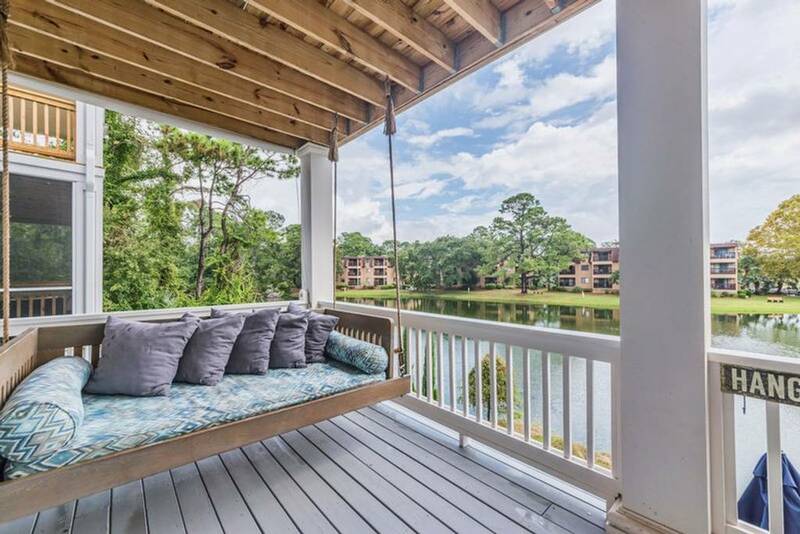 Another gorgeous Sea Pines Hilton Head Airbnb, this family home backs onto a peaceful lagoon in one of the island’s most prestigious communities. The beach is just minutes away thanks to the community beach shuttle, which operates daily. On entering this luxurious vacation rental, you’ll immediately notice the airy, open concept with sky-high ceilings and white-washed plank flooring. The attention to detail in this luxury home’s design is truly impeccable, making the price tag of around $360 a night a total steal. 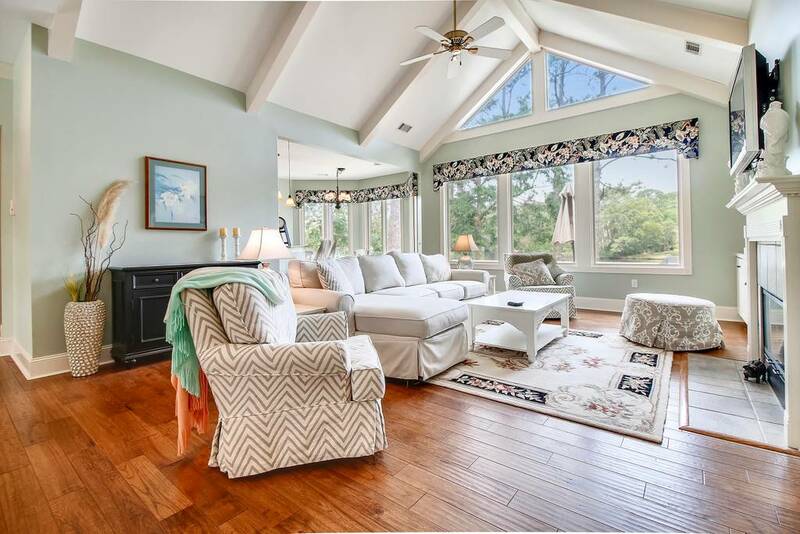 This vacation home in Sea Pines, Hilton Head can accommodate up to 8 guests with three big bedrooms and three full bathrooms. The renovated kitchen features brand new stainless steel appliances and comes fully equipped with all the cooking essentials you could need. The home is particularly pet- and baby-friendly, with a high chair and pack ‘n’ play available, plus a convenient laundry room. Tucked away in a quiet, peaceful Sea Pines Plantation neighborhood, this luxury Hilton Head Airbnb vacation rental is simply stunning. Enjoy a laidback, residential vibe with access to the community’s fantastic amenities including an enormous swimming pool, BBQ facilities, and tennis courts. Coligny Park Beach is just a quick 7-minute drive or 20-minute cycle away. 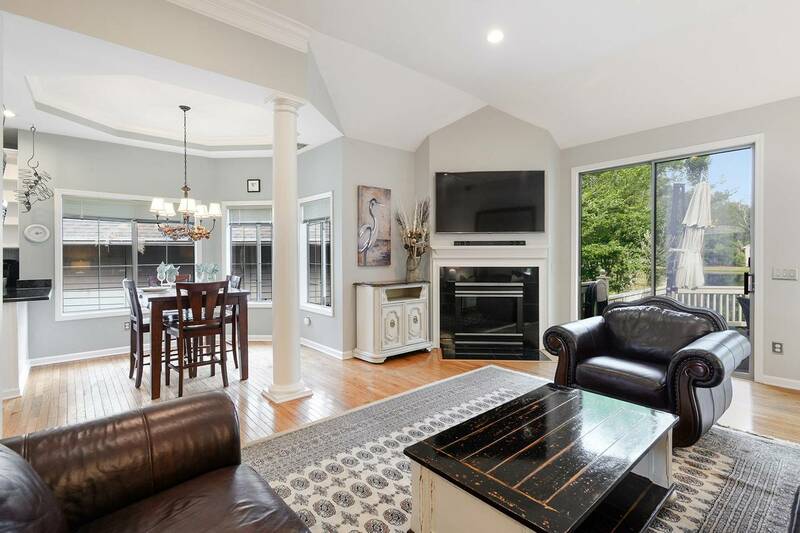 This spacious, beautifully upgraded vacation rental can easily accommodate up to 8 guests with three bedrooms and 2.5 bathrooms. One of the rooms is ideally arranged for kids, with two sets of bunk beds while the master is the perfect grownup retreat with porch access and a luxurious ensuite bath. The property is available to book this summer for just around $350 a night. Ask the local residents and they’ll tell you: Mid-Island is the place to be on Hilton Head. 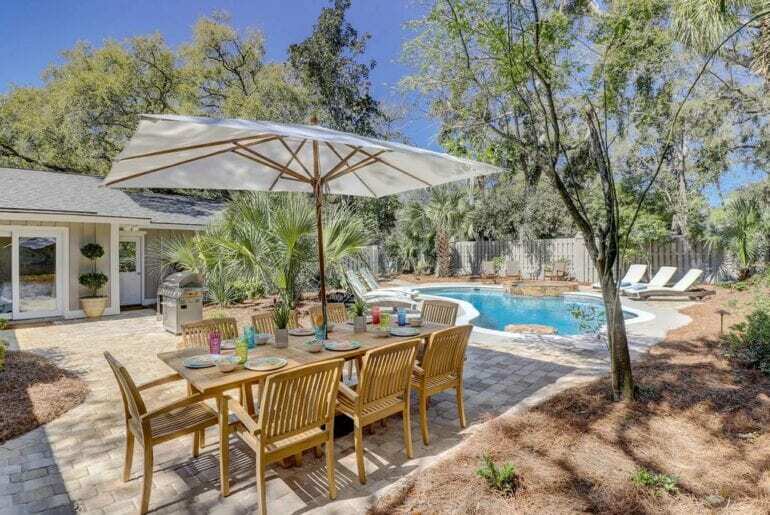 That’s why we adore this boutique vacation rental with pool near Folly Field Beach, available for around $600 a night this summer. 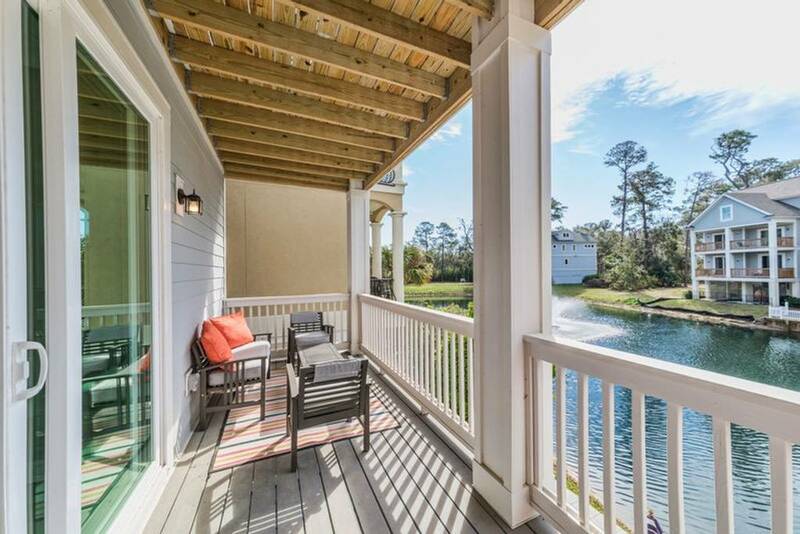 This gorgeous new home is located on a quiet lagoon just 0.3 miles from the best beaches on Hilton Head. Designed like a high-end, boutique hotel, this Airbnb has tons of space to accommodate 16+ guests in serious style. There are five big bedrooms with 8 beds in total, plus four full bathrooms. 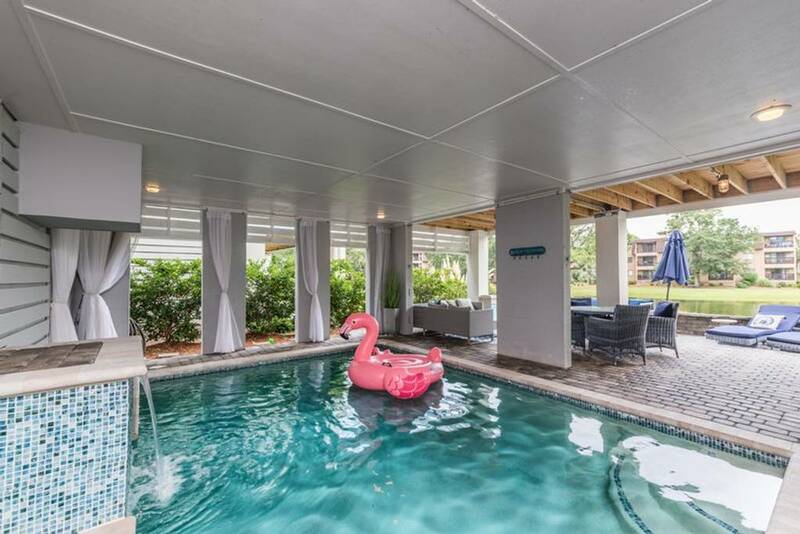 The private backyard and deck is the perfect place to entertain a large group, with a beautiful saltwater swimming pool (heated), waterfall feature, sunken lounge seating, plus outdoor grilling and dining areas. 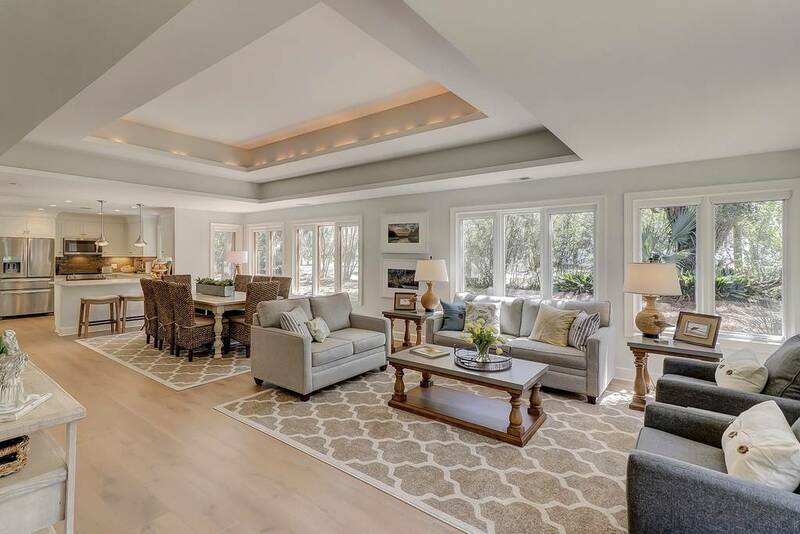 Inside the home is just as glamorous, with a spacious open-concept floor plan, gourmet kitchen, and multiple covered porches overlooking the water. Grownups will appreciate the home’s boutique-quality design and many spaces to entertain. 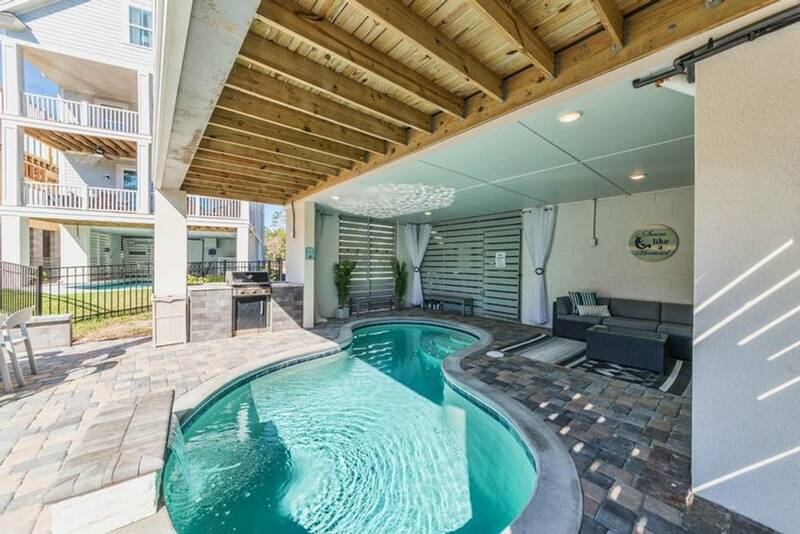 Outside is a covered, heated saltwater swimming pool with waterfall feature. This overlooks a paved patio with additional lounge space, outdoor BBQ grill, and dining area, which all back out onto a peaceful lagoon. This gorgeous ranch-style home in North Forest Beach is less than 200 steps from the sand dunes on a quiet, residential block. 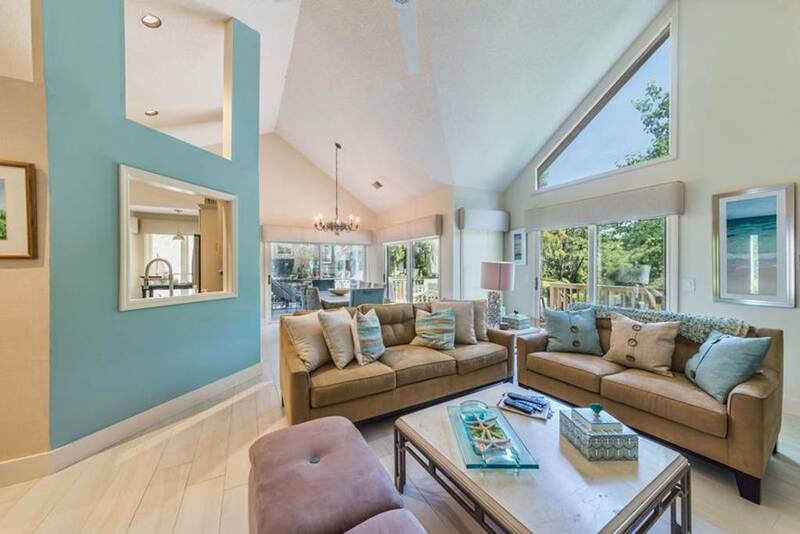 Designed with families or groups of friends in mind, this Hilton Head vacation rental feels more like a standalone, luxe retreat near the beach. We must start with the backyard as it’s truly an entertainer’s dream: Multiple lounge spaces, dining areas, and an outdoor BBQ are all great, but the swimming pool is truly a masterpiece. There’s a hot tub on one end and an integrated table with seating on the other, perfect for hanging out with a couple of cocktails after a lazy morning at the beach. There’s plenty to love inside, too, with space to accommodate up to 13 guests. The home has four bedrooms with 8 beds in total, plus three full bathrooms, so there’s room for everyone to spread out in style. Available from around $410 a night, this Hilton Head Airbnb is sure to book up quick for the summer! 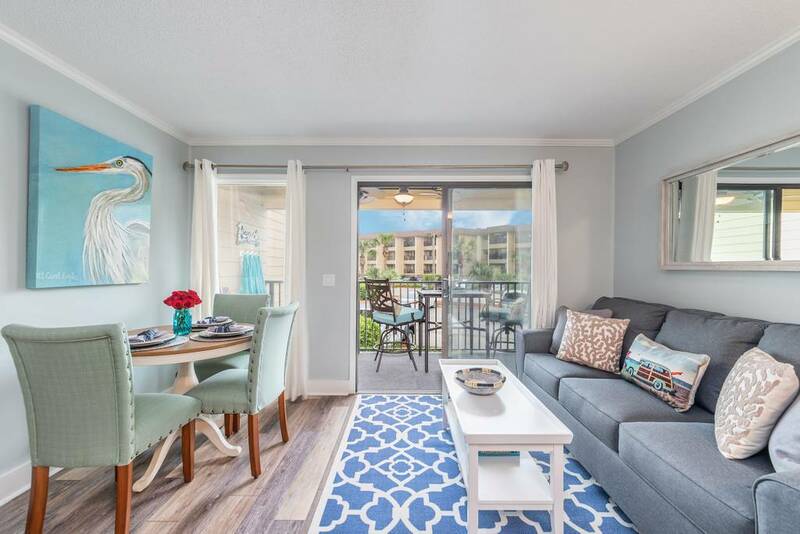 Located within an exclusive, gated resort, this bright and inviting Hilton Head beach cottage condo has lots of attractive added amenities. The resort features a huge, oceanfront swimming pool along with multiple restaurants and a gym. This ideal location on Hilton Head Island is also close to the area’s finest golf courses, so you can practice your swing after a morning swim. This resort-style condo is ideal for a small family, able to accommodate up to 6 guests in total with one bedroom and one bathroom. This includes a large master suite as well as two built-in bunk beds included in a separate sleeping area just for kids. Stay in one of the best locations on Hilton Head this summer from just about $120 a night. 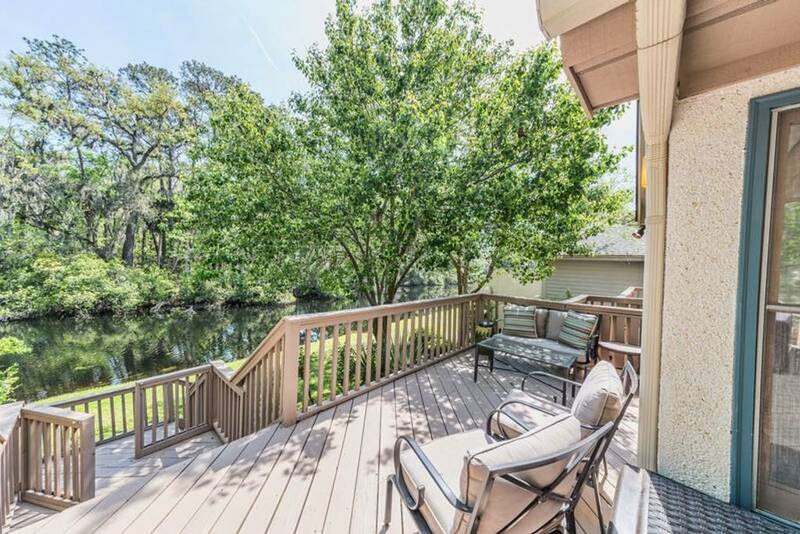 One of the very best Hilton Head Airbnbs is tucked away on a quiet cul de sac that backs onto a lush, 11-mile stretch of lagoon. This luxurious villa in Hilton Head with pool has some truly impressive, resort-quality features. The backyard is expansive, with a huge swimming pool and hot tub overlooking the tranquil lagoon. No backyard neighbors here! Enjoy peace and privacy while still being just 0.6 miles from the beach. Take a few kayaks for a spin in the lagoon river and enjoy the natural scenery and gentle wildlife. 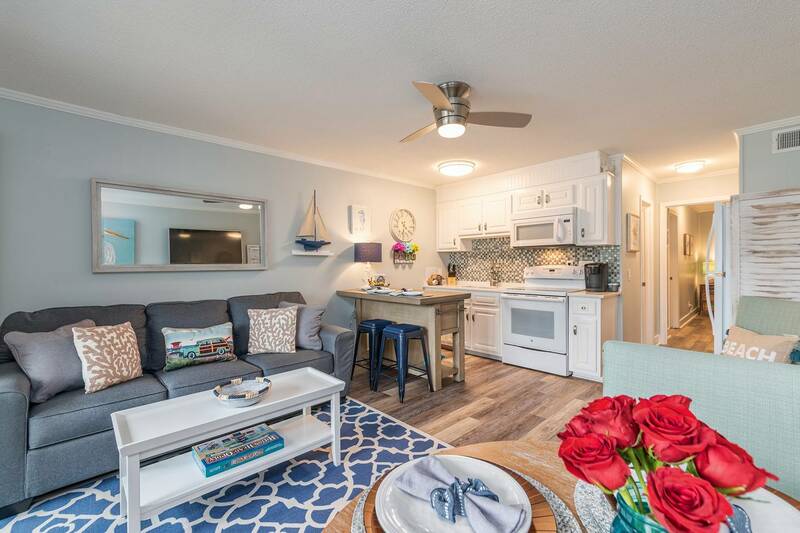 This spectacular Hilton Head Airbnb does book up far in advance from around $600 a night, so if you’re thinking about planning a summer getaway, don’t hesitate! There’s space inside to accommodate up to 10 guests easily, with four big bedrooms and three bathrooms. This magnificent home is full of abundant natural light and lovely, lush views from nearly every room. Enjoy relaxing in the lounge spaces indoors or entertain with ease outside on the spectacular deck. This is truly luxury Hilton Head living at its finest.